Although Hitchcock had announced that he was leaving Gainsborough Pictures and had signed a three-year contract with British National (which would shortly become British International Pictures), he still had a few months left on his Gainsborough contract and so he directed Ivor Novello once again. 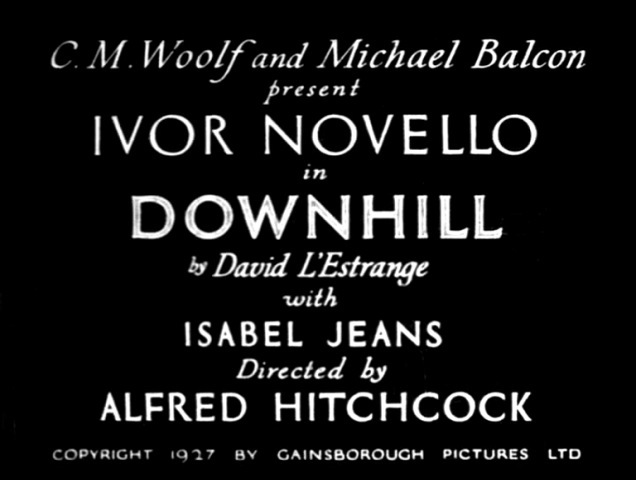 "Down Hill" was a play written by Novello and Constance Collier — under the combined alias "David L'Estrange" — that had enjoyed moderate success in the UK during 1926, partly due to Novello's sizeable female fanbase. Novello and Collier had previously collaborated on the successful stage play "The Rat", a film version of which was directed by Graham Cutts for Gainsborough. The scenario for the film was prepared by Eliot Stannard, with input from Angus MacPhail. Apart from Novello, the only member of the original stage cast who also appears in the film is actress Hannah Jones. Filming on Downhill began on 17th January 1927 and was completed in early April. We went to the theatre first and in those days we used to go to a first night in white tie and tails and opera hats. So, after the theatre, I directed this scene in a white tie and top hat. The most elegant moment of direction I've ever had. Whilst busy filming at the Islington Studios, Hitchcock was visited by Noel Coward and they discussed the upcoming adaptation of Coward's Easy Virtue. In late March, Hitchcock combined the shooting of exteriors and backgrounds for Easy Virtue in France with filming some final footage of Novello. I had a chance to experiment in those scenes. At one point I wanted to show that the young man was having hallucinations. He boarded a tiny schooner, and there I had him go down to the fo'c'sle, where the crew slept. At the beginning of his nightmare he was in a dance hall. No dissolve, just straight cutting. He walked over to the side wall and climbed into a bunk. In those days dreams were always dissolves and they were always blurred. Though it was difficult, I tried to embody the dream in the reality, in solid, unblurred images. For the delirium sequence on the boat, Hitchcock had the film tinted a sickly shade of green to express both the nausea and mental anguish affecting Rodney. At one part of the film the screen projection fades out, a curtain rolls up, and without breaking the continuity, a scene from the play, as it was done on the stage, is actually acted by Mr Novello and his schoolboy friend. At the close they are summoned to the Head's study, and as the curtain goes down the camera shows them walking down the cloisters dejectedly. This is an effective screen device and gives Mr Novello an opportunity of appearing in the flesh before his admirers. It is more by the brilliant treatment of the director and the excellent acting that this film is likely to appeal to the public than by the strength of its story. But if the plot is hardly plausible, Hitchcock 's treatment is of great interest. The photography is admirable. Mr. Ivor Novello is excellent as himself, but he is never so much like a schoolboy as when he appears in person in an interpolated scene. This scene, on Monday night, seemed to interest the audience, but the advisability of mingling the two forms of entertainment seems very doubtful. "Downhill" carries out every promise of its predecessor ["The Lodger"] without being at all a good film ... I have never seen such an interesting, production of rubbish nor a clever film which deserved quite so little praise. The film was released under the title "When Boys Leave Home" in the US in 1928. One memorable shot in the film was from Julia's point-of-view as she leans backwards in her chair and sees Roddy enter the dressing room. Hitchcock would re-use the shot in Notorious (1946), with Ingrid Bergman watching Cary Grant entering her room. In "The Encyclopedia of Alfred Hitchcock", Thomas Leitch notes that Downhill is "by far the director's most misogynistic work, overflowing with images of women as harpies and betrayers who prey on helpless young males like Rodney". However, writing for the BFI, Mark Duguid states that "some of the blame for this parade of monstrous women ... should be laid at Novello's door, and it's not hard to imagine that the play reflects the experiences of a homosexual matinee idol oppressed by unwanted female attention."